Headache is the term used for pain occurring anywhere around the head and the neck. Frequent and strong headaches cause disruption to both personal and professional life. Headaches can cause extreme discomfort and the causes could be medications, stress, exertion, injury, sinus, intake of very cold or very hot food and drinks, etc. 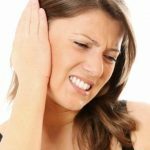 In this article we describe how peppermint oil can be used to treat headache. Does Peppermint oil Really Work for Headaches? Peppermint oil is commonly used as a muscle relaxant. Menthol present in peppermint oil acts as a pain-killer and can relieve pain caused by sore muscles, aching back and even strong headaches. Topical application of peppermint oil proves its benefits as a remedy for curing headaches. It also works as an expectorant clearing the clogging of the respiratory tract which causes sinus and sinus-related headaches. It also has the ability to improve blood circulation in the area around which it is massaged. A study has proved that peppermint oil has a strong analgesic effect that helps in relieving pain caused by migraines. A number of essential oils have been proven to provide relief from headache instantly. The benefits of peppermint oil and its use for headache are mentioned here. It acts as a stimulant to increase blood circulation, helps with increasing metabolic rates and oxygenation of vital organs in the body including the brain. Mix peppermint oil with some warm water or coconut oil. Use a cotton ball, dip it in the solution and rub it along the forehead. This can be reapplied 3-4 times and provides relief within 30 minutes of use. Peppermint oil can be mixed with other carrier oils such as jojoba oil or almond oil. This can be applied topically on the forehead as instructed in the above technique to relieve headaches. Large quantities of peppermint oil are not recommended to be used in case of infants or children. 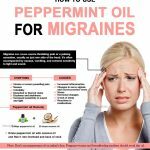 Although a very effective home-remedy for treating headaches caused by sinus, external pressure, migraines and/or lack of blood circulation, peppermint oil is not recommended to be used if you are taking any other prescription drugs. The strong smell of peppermint oil can cause irritations and nausea if continuously used in excess quantities. Exercising and ensuring movement of eyes and neck during work hours can help prevent headaches. 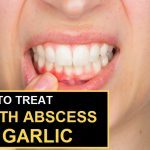 How to Use Garlic for Tooth Abscess?